Archaeological evidence to date suggests that all human beings were hunter-gatherers prior to twelve thousand years ago. Hunter-gatherer is an anthropological term used to describe human beings who obtain their food from the bounty of nature, hunting animals and gathering wild plants. It is a subsistence lifestyle, practiced by all early human societies. Such people are generally nomads, moving on as food supplies dwindle. There is little development of skills or specialized labor beyond that required for hunting and gathering food. Such societies generally remain small, consisting of several, often related, family units. Archaeological evidence to date suggests that all human beings were hunter-gatherers prior to twelve thousand years ago, before the Neolithic Era. 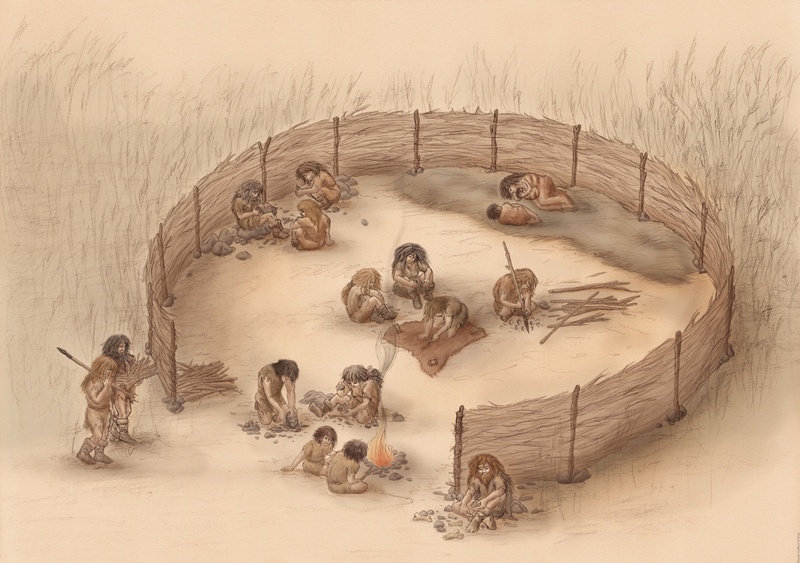 The Neolithic revolution, at the beginning of the Holocene epoch, marks the emergence of agriculture and domestication of animals and the subsequent decline of hunter-gatherer populations. However, the line between agricultural and hunter-gatherer societies is not clear cut. 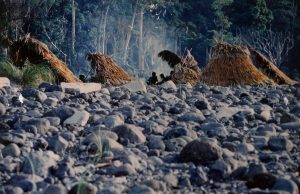 Many hunter-gatherers consciously manipulate the landscape through cutting or burning inedible plants while encouraging those that can be consumed. In agricultural societies people often continue to hunt and gather. They may farm during the temperate months and hunt during the winter. In developed countries, even today, many people enjoy spending some time hunting for food or for recreation. The nature of the available food supplies leads hunter-gatherer societies to develop different specializations. Some hunt big game, or trap animals, while others may fish in lakes, rivers, or along the coast. An older term found in Scandinavian countries is hunter-trapper instead of “gatherer,” signifying their use of complex trap systems involving holes in the ground to catch elks, reindeer, etc. Hunter-gatherer societies tend to have very low population densities. Only a limited number of people can congregate without quickly exhausting the local food supplies. In climates that can support agriculture, farmland will support population densities 60 to 100 times greater than land left uncultivated. 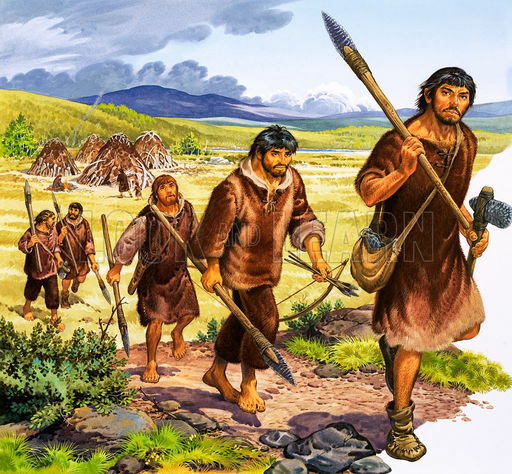 Nomadic hunter-gatherer societies usually have non-hierarchical social structures, unlike higher-order horticultural, pastoral, and industrial societies. The group usually consists of a small number of family units, often related, comprising a tribe. Typically, men are responsible for hunting and women for gathering. The male puberty rite of passage often receives greater emphasis in hunter-gatherer societies than the other three ritual occasions celebrated in all human societies (birth, marriage, and death). Their puberty rites, which may take as long as a month, generally include instruction in adult responsibilities, rituals dramatizing changes in relationships between boys and girls and with their mothers, and physical ordeals that often involve hunting. Hunter-gatherers are foragers, dependent upon the natural availability of food. Consequently, they are relatively mobile, moving on as their food supplies become exhausted. 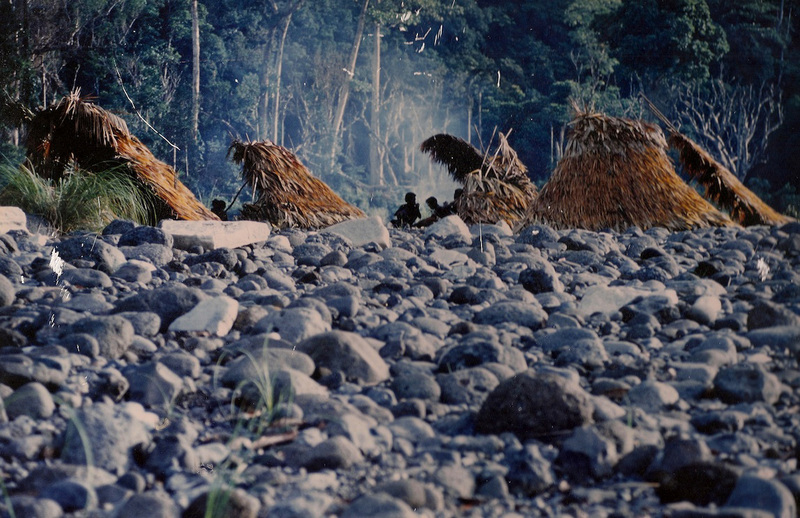 This nomadic lifestyle, in which all possessions must be carried, leads hunter-gatherers to rely on materials available in the wild to construct simple shelters. There is rarely any elaborate building of permanent housing or development of cities in such societies. Their mobile lifestyle generally means that there is no possibility of storing surplus food and thus the society remains at a subsistence level. Specialization of labor does not develop beyond the division of responsibilities between men (hunting) and women (gathering and domestic). Each family acquires only enough food for its own needs and has no surplus to share or trade with others. 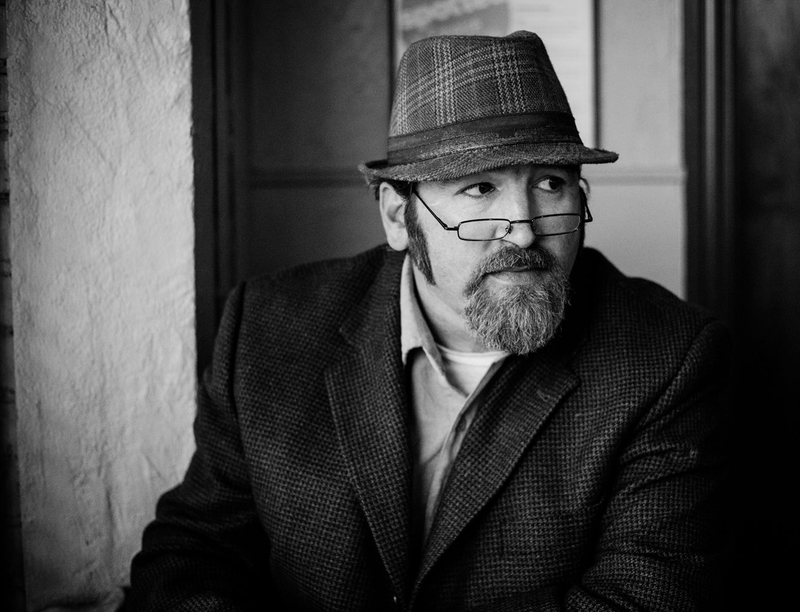 Thus, full-time leaders, artisans, or other specialists are rarely supported by pure hunter-gatherer societies. However, in cases where food is abundant and reliable, a hunter-gatherer group may become sedentary. In such cases, a combination of hunting and gathering with agriculture or horticulture, animal husbandry, or herding is common. Moving from the subsistence level to creating surplus provides support for societal development. The existence of surplus relieves individuals, or family units, from the burden of having to procure sufficient food for their needs every day. This frees them to develop skills and talents in ways that benefit others, who in return can share surplus food or other products. In this way, using flour from acorns and smoke-dried salmon for food, natives of the American Pacific Northwest, such as the Haida, were able to become skilled artisans, famous for their woven clothing and elaborately carved items. Today hunter-gatherer groups are found in the Arctic, tropical rainforests, and deserts, where other forms of subsistence production are impossible or too costly. 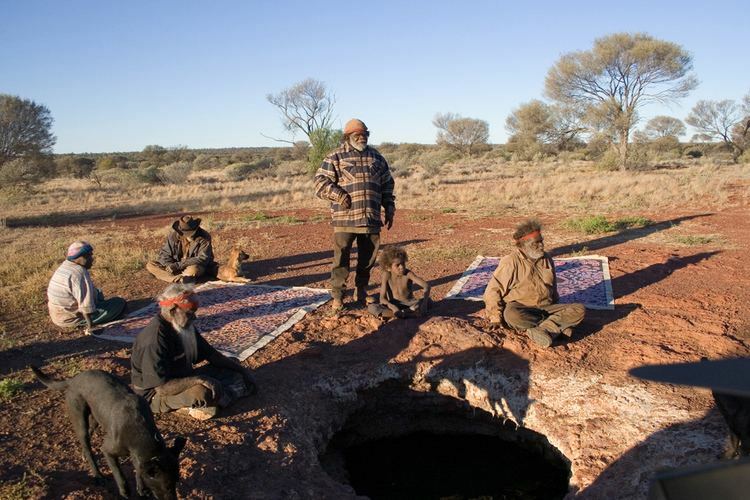 Examples of traditional hunter-gatherers that continue this lifestyle today are the Bushmen of southern Africa, the Pygmies of central Africa, and the Spinifex people of western Australia. Other groups do not have a continuous history of hunting and gathering; in many cases their ancestors were farmers who were pushed into marginal areas as a result of migrations and wars. Lee, Richard B, and Richard Daly (eds). 2004. The Cambridge Encyclopedia of Hunters and Gatherers. Cambridge University Press. Panter-Brick, Catherine, Robert H. Layton, and Peter Rowley-Conwy (eds). 2003. Hunter-Gatherers: An Interdisciplinary Perspective. Cambridge University Press. This entry was posted in Ancient, History, Prehistoric, Prehistory. Bookmark the permalink.